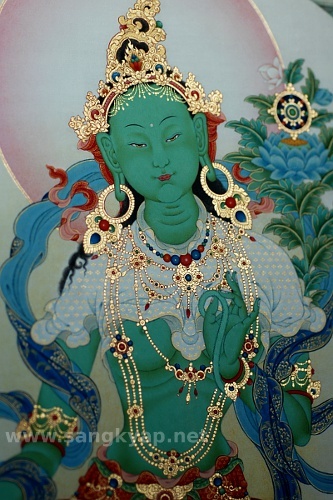 Burnishing the gold of main deity, Green Tara. Flower pattern on her calf which sparkle by an angle of the light. By burnishing, Gold will give much more metalic texture and it makes beautiful contrast with very matte area painted with natural mineral pigments. 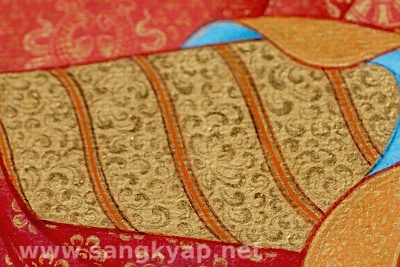 Check entire thangka once again. I suppose there is no painter who would spend such long time for one single thangka of this size. I'm really slow painter. But thanks to that I think I could make enough detail even for the small Taras or Amitabha to be seen individually . 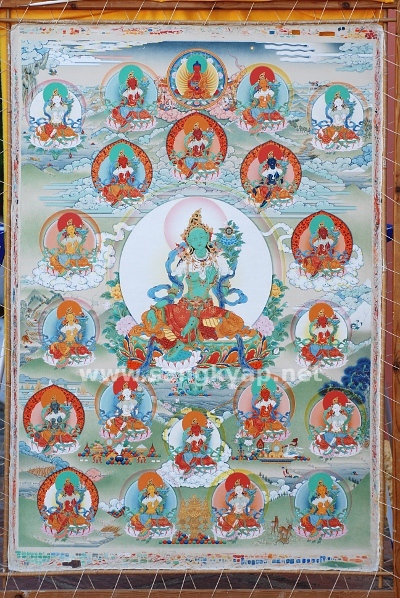 There are several different traditions of how to depict the thangka of 21 Taras and it can be quite different even in a same tradition depends on Lama's view. So the first thing I had to do for this thangka was the reserch and preparation which took a lot of time before I actually started to paint. Starting with the books and photos I already had and visited Tara temple of some monasteries to see the statues and mural paintings. Of course, I checked a lot of images on the internet and texts and articles about 21 Taras both in English and Tibetan, even Sanskrit text (English translated one since I can't read Sanskrit). 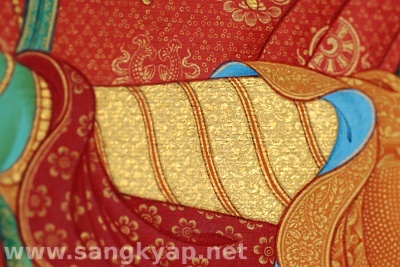 The advices from Lamas and my thangka teacher also helped me a lot. I have also received many kind messages which encouraged me to make full effort from who visited my atelier and who have seen my blog or website. I'm very grateful to all these kind people who supported me and to the sponsor who allowed me to spend so much time to paint this thangka. wow! Congratulations, this is just stunning, a real object of veneration. Thank you! It took me time but I'm really happy.